Newly commissioned Lieutenant Johnny Winger returns to Banikaiyan, Mali for nano forensics on the HNRIV virus outbreak. 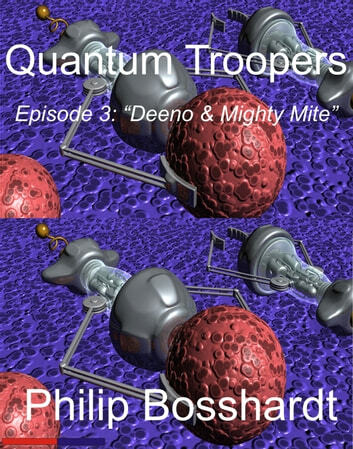 A medbot insert into a corpse goes horribly wrong and the squad is swarmed by enemy bots but newly minted troopers Deeno D’Nunzio and Mighty Mite Barnes save the day. Forensic evidence points to an orbiting lab and Winger’s team investigates. They learn the threat is worse than imagined; highly placed people inside UNIFORCE are working for the Red Hammer cartel. The trail of evidence leads to a presumed Red Hammer base in Hong Kong. Winger and 1st Nano investigate but are overwhelmed and caught, trapped inside the base. A new and improved virus is about to be unleashed and only Red Hammer has the antidote…and it’s highly addictive and programmable. 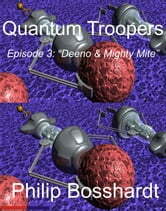 Third episode in the Quantum Troopers serial.